Clove Bud Essential Oil smells spicy like actual cloves. The aroma of this oil is typical of the Indonesian variety which is not as spicy as the Sri Lankan or Indian variety. It is sweet but more herbaceous. 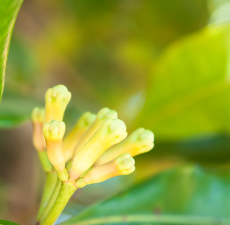 Clove Bud Essential Oil is derived from the tree Syzgium aromaticum plant. It is a slender evergreen that grows up to 12 meters in height (approximately 36 feet). At the start of the rainy season, long buds appear. They change color over time and are beaten from the trees and dried. These are the cloves sold commercially. The bud of this evergreen, indigenous to Southeast Asia, has a long history as an effective agent for minor pains and aches, particularly dental pain because of its numerous effects on oral tissues. It is widely used in contemporary Ayurvedic and Chinese medicine. The word Clove comes from the Latin word clavus, meaning nail, since the shaft and head of the clove bud resembles an ancient nail. Cloves and nutmeg were among the most precious of spices of Europe of the 16th and 17th centuries, and were worth more than their weight in gold. Today it is used worldwide as a culinary spice from East Indian masala blends to Dutch cheeses, in herbal cigarettes and pomanders, and even as an ant repellent. Clove Bud Oil can cause sensitization in some individuals and should be used in dilution. It should also be avoided during pregnancy.